Hyundai has signed on noted Bollywood actor Shahrukh Khan for endorsing the recently launched Xcent compact sedan. The South Korean automaker has also released a TV commercial featuring the Xcent and the actor. Shahrukh Khan has been associated with Hyundai, as a brand ambassador, ever since the automaker set shop in India, a decade and a half ago. 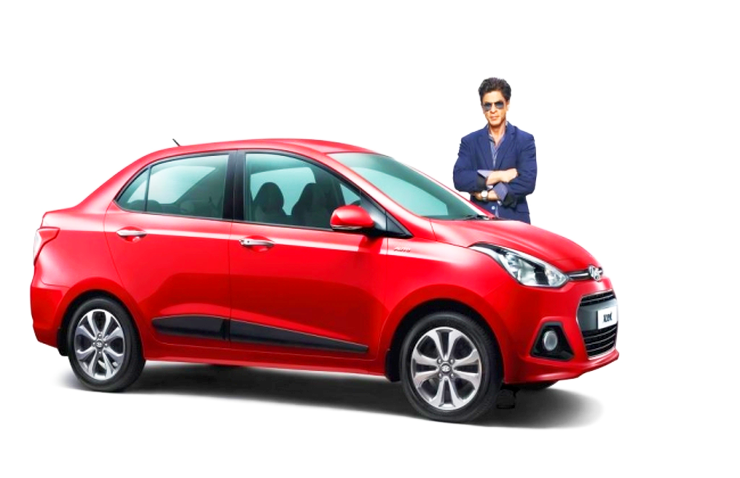 Earlier, the Santro and i10 line up of cars were endorsed by Shahrukh Khan, and the Xcent is the latest Hyundai in the star’s endorsement kitty. In most Hyundai car ads featuring Shahrukh Khan, the actor is shown as a consummate family man, in line with his off screen personality. Shahrukh Khan has been associated with Hyundai for the past 16 years, ever since the first Santro rolled out from the South Korean automaker’s Sriperumbudur factory in 1998. Apart from being seen in Hyundai TV commercials, the actor has been seen making appearances at car launch events for Hyundai. The Xcent is aimed squarely at families who seek a sedan styled car, in a compact sub-4 meter package and at an affordable price. The car is sold with petrol and turbo diesel engine options. Five speed manual and 4 speed automatic gearboxes are offered on the petrol powered Xcent with the diesel powered model making do with a 5 speed manual transmission. Sharing its platform with the Hyundai Grand i10, the Xcent also shares interiors and features with its hatchback sibling. The Xcent was launched in India earlier this year, in March. Sales of the Xcent have been strong right from the outset, with the car managing a steady 6,000+ units monthly average. The Xcent competes with compact sedans such as the Tata Zest, the Maruti Dzire and the Honda Amaze. Hyundai Xcent prices begin at 4.66 lakh rupees, making the car one of the most affordable compact sedans in India, second only to the recently launched Tata Zest, which has rewritten pricing rules in its segment.